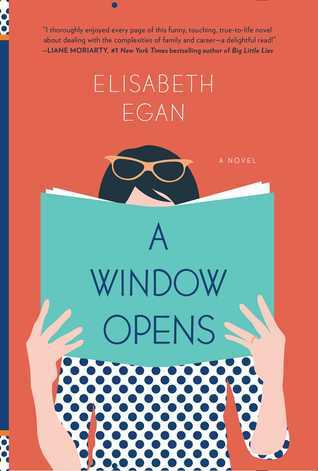 In A Window Opens, beloved books editor at Glamour magazine, Elisabeth Egan, brings us Alice Pearse, a compulsively honest, longing-to-have-it-all, sandwich generation heroine for our social-media-obsessed, lean in (or opt out) age. Like her fictional forebears Kate Reddy and Bridget Jones, Alice plays many roles (which she never refers to as “wearing many hats” and wishes you wouldn’t, either). She is a mostly-happily married mother of three, an attentive daughter, an ambivalent dog-owner, a part-time editor, a loyal neighbor and a Zen commuter. She is not: a cook, a craftswoman, a decorator, an active PTA member, a natural caretaker or the breadwinner. But when her husband makes a radical career change, Alice is ready to lean in—and she knows exactly how lucky she is to land a job at Scroll, a hip young start-up which promises to be the future of reading, with its chain of chic literary lounges and dedication to beloved classics. The Holy Grail of working mothers―an intellectually satisfying job and a happy personal life―seems suddenly within reach. Despite the disapproval of her best friend, who owns the local bookstore, Alice is proud of her new “balancing act” (which is more like a three-ring circus) until her dad gets sick, her marriage flounders, her babysitter gets fed up, her kids start to grow up and her work takes an unexpected turn. Readers will cheer as Alice realizes the question is not whether it’s possible to have it all, but what does she―Alice Pearse―really want? This is such a light read. I was expecting it to be a little… more. Blurbs had said this book was funny but I didn’t think it was. There was a few kind of funny parts but I felt like they were forced and didn’t really belong. I thought the characters were likable enough even though I didn’t really fall in love with them. I didn’t relate to Alice at all just because she seemed to lack ethics and she made some really wacky decisions. But I did find her interesting. I liked the story line with her father a lot and I wished that would have been the sole story line of the book. I think for the right reader, this book would be great. But for me personally, I found it to be okay. I didn’t hate it but I wish somethings would have been different.